John Malkovich is a fun dude to watch, whether he’s wearing a powdered wig, punching Brad Pitt or playing himself in a bizarre Spike Jonze film. Introducing Technobohemian, a new line of clothing designed by the great American thespian John Malkovich, now available at the Webster. 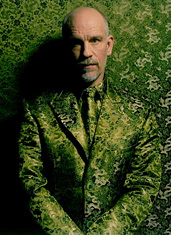 Now, we know what you’re thinking: “John Malkovich is kind of a quirky guy. Please tell me these clothes are as eccentric as he is.” Yes, yes, you can rest assured, these threads are as strangely delightful as the man who entertained you as a robot in Making Mr. Right. Working closely with an Italian designer, Malky has got you covered in the polka-dot-blazer department, the paisley-tie department and the double-collared-jacket department. Unfortunately, not all of these are at the Webster (the collection preview is online), but you’ll find a bunch of interestingly patterned button-downs in faded yellows, lavenders and salmons, as well as some ’70s-ish jackets. But if you’re really looking to go full Malkovich, we suggest trying on a pair of the drawstring pants, the sort of comfy yet attention-grabbing trousers you could flaunt at your next poolside lounging session at the Standard. Go ahead, bring a script with you.